A Barefoot Books Story Time! 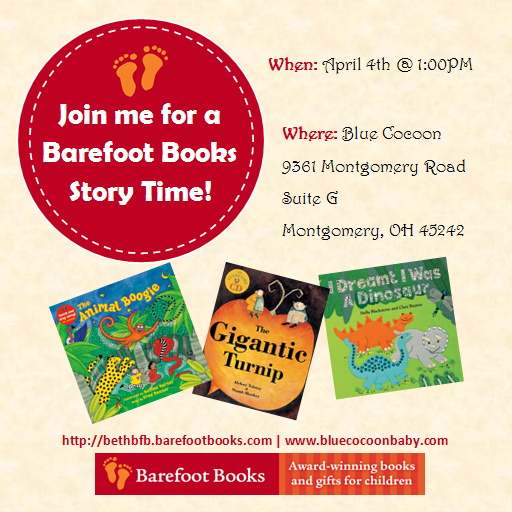 I’m so excited to announce that I’ll be doing my first Barefoot Books story time this weekend! If you are in the Cincinnati area and have littles you’re looking to entertain, why not come out and join me (and bring a friend, or two, or more)? The story time will be targeted to kids under 5, but all ages are more than welcome to attend! I promise to make it a fun and engaging afternoon. We’ll get the wiggles and the giggles out as we roar along with “I Dreamt I was a Dinosaur“, practice our counting and animal sounds with “The Gigantic Turnip“, and get our groove on with “The Animal Boogie“. If we have time, there may also be some other surprise books for us to explore! I’ll also have some copies of the books we’re reading available for purchase, as well as a selection of other great titles for this age group. Of course, if I don’t have something on hand, I can always order it for you, or, better yet, you can book a party and get it for free! Party hosts who commit to a party on Saturday will get a special deal from me, on top of the great incentives provided by Barefoot Books! I do hope you’ll join me! Questions? Ping my Barefoot Books page on Facebook or post a comment here! Hope to see you there… happy reading!